Ask a Korean! : AAK! PSA: Free Screening of "My Heart if Not Broken Yet"
AAK! 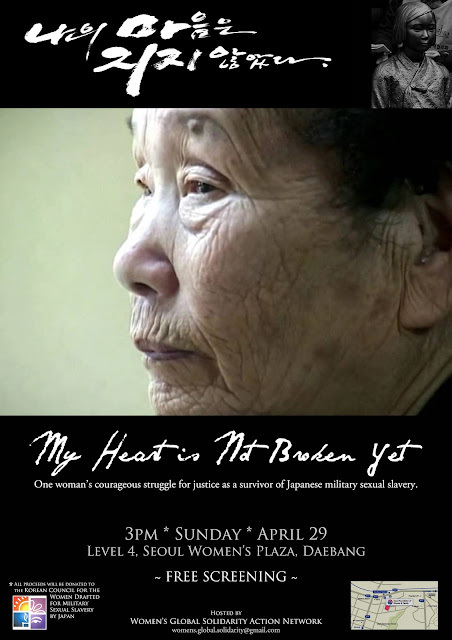 PSA: Free Screening of "My Heart if Not Broken Yet"
The Women's Global Solidarity Action Network (WGSAN) will be hosting a free documentary film screening of "My Heart is Not Broken Yet", a powerful testimony of Song Shin-do Halmoni's continued fight for justice as a former "comfort woman" (women who were drafted into military sexual slavery during the Japanese occupation in World War II). Come watch this courageous survivor, witness her story, and help raise global awareness so we can get this issue resolved in 2012. 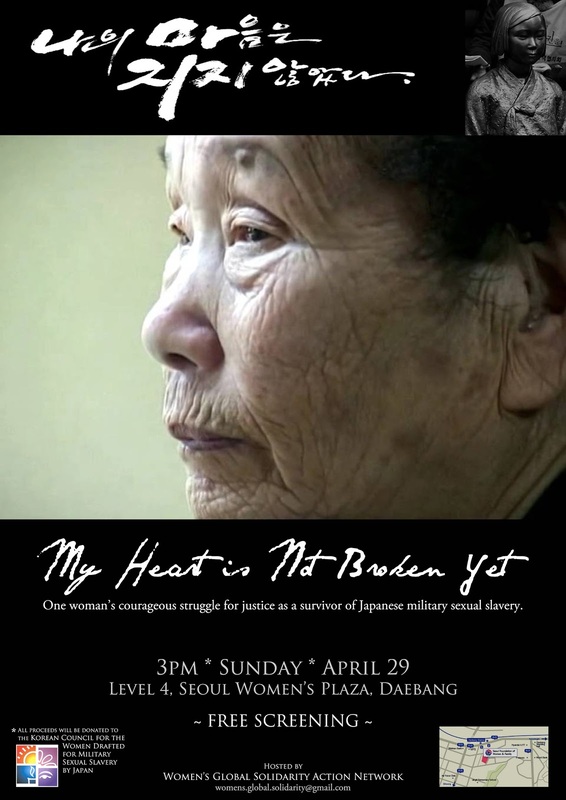 "My Heart is Not Broken Yet" tells the story of the trail and struggle of Song Sin-do Halmoni who has continually campaigned for redress on the issue of the "comfort women." Although she lost the trial she states that "my soul is undefeated" which reveals her desire to fight for justice. The film screening will be on Sunday, April 29th at 3pm in the 시청각실 (screening room) on the fourth floor at the Seoul Women's Plaza. To get to Seoul Women's Plaza, go out exit 3 of Daebang Station (대방역) on line 1, walk 50m into the left alley. As a chinese person, I understand why most chinese do not create too much drama about what has happened in the past, most things being better known and not said. However, why do koreans keep bringing up issues in the past into the foreground? Japan has argubly done more in terms of reparations for korean than any other countries. "However, why do koreans keep bringing up issues in the past into the foreground? Japan has argubly done more in terms of reparations for korean than any other countries." I am disappointed (but not surprised) when I hear this from Japanese acquaintances. I am rather more surprised to hear it from a Chinese person however given that your country was also invaded and brutalized. Why to Koreans keep bringing it up? I am sure the Korean can answer this better than I, but I majored in Japanese studies and live in the country so let me give a brief reply. I think it is very hard to argue that Japan has sufficiently apologized for what it did to the people of Korea (and other Asian countries). Part of Japan's 'repatriation' to Korea was if anything extremely cynical, signing a deal with a dictator that would remove them from further obligations, and this at a time when Korea was desperately poor and Japan extremely rich. It was, in short, not an honest owning up to the past, but a play to lessen the size of future monetary obligations. Actually, it is the other way round. Most chinese people hate the japanese for what they did during the occupation of most of china by japan. A lot of people who lived through the occupation period in fact are still alive. If protesting would actually make the japanese government do what it takes for chinese people to forgive them, chinese people would have protested a long time ago. However, any logical person can see that the degree of action japan needs to undertake to heal the wounds is literally impossible for japan to actually do. Hence chinese people are largely quiet about repatriations, since bringing up the past will only cause more pain. Chinese people only do things that is likely to succeed. However, there may be a large difference in how koreans and chinese think. Regarding repatriations, at least japan did sign a repatriation deal with korea though. I havent heard of japan signing any repatriation deals with other countries. It is probably just me not digging into the subject. I grew up learning that the japanese thinks they actually did good in china in terms of modernization and refuses to acknowledge everything they did and havent made any attempts to provide repatriations for china though. Actually, in korea's case, it is japan wont do anything. In china's case, it is japan cant do anything. If it is because japan can actually do what koreans wants to ease relations and clear the hate, then I understand why koreans are still protesting. I found the relevant AAK article.